Available only in the French hymnbook, “He Is Born, See the Child Divine” (sometimes referred to as simply “He Is Born”) is a lively, fun, and cheerful Christmas selection. There are numerous translations and harmonization available. 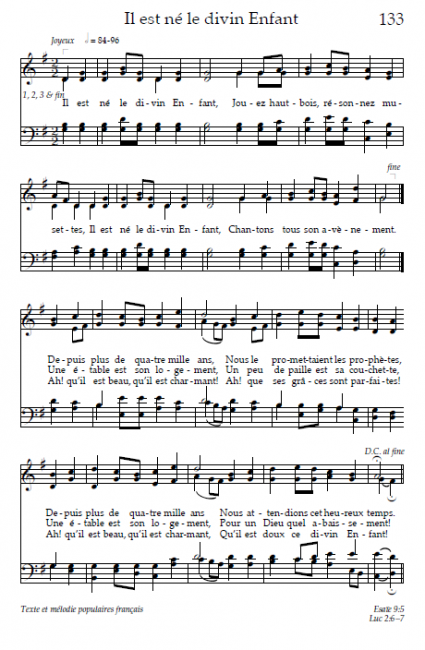 The following is the version from the French LDS Hymnbook. He is born, see the Child divine! Sound the oboe, play the bagpipes. Sing we all our sweetest song. All the earth awaited this. Come away, ye Orient Kings! Come and join us in our singing. Come and worship Christ the Lord! This is an arrangement by Robert Wetzler titled “He Is Born.” Read the full review here.